Summary of article "Lanca", published in Polish in "Studia do dziejów dawnego uzbrojenia i ubioru wojskowego" , issue VI (Kraków , 1974 ). 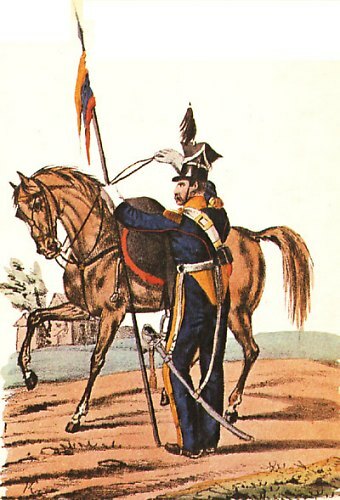 The short cavalry lance, about 250 cm long, was introduced to the Polish army rather late, towards the end of the 18th century (1789). It replaced the long and heavy cavalry lance about 500 cm long, used till that time by the Polish hussars. The two belong to the same family and their similar names may cause misunderstanding but in fact they differ greatly from each other. 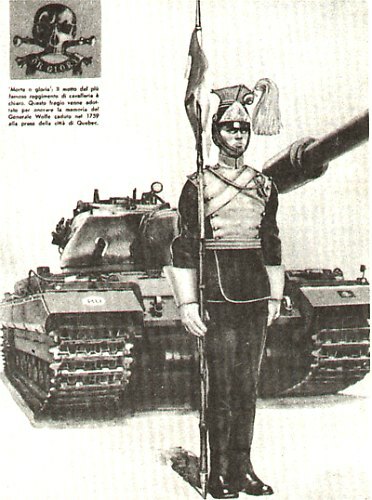 The hussar lance acted by its mass and power and was adapted only for an indirect push from under the horsemans arm, its extreme length excluding any other manoeuvre. On the contrary, the short lance carried by the light troops was a quick and accurate weapon which a rider could handle almost like a sabre. In the hand of a skilled soldier the light lance became the most dangerous cavalry weapon ever invented, effective not only in a mass charge but also in a melée and in single combat, in any circumstances and in any sort of terrain. This weapon, which gained in the time of the Napoleonic wars the title of "queen of arms" is still waiting for a special chapter in military history. Here is the first essay on its origin and development. It seems most probable that the prototype of the short lance was born on the vast steppes of Central Asia as a weapon of the unmatched Mongolian cavalry somewhere in the 12th century or even earlier. In the beginning of the 14th century this weapon, thanks to the Tartars of Crimea, was carried around on the territories of the Russian Dukedoms, whence it became assimilated by the Lithuanians. From the end of the 14th century the Grand Dukes of Lithuania settled in their domains some groups of these Tartars, giving them land and, according to the feudal law, requiring some military duties. Here we see the origin of the light Tartar cavalry in the service of the Lithuanian and later on of the Polish-Lithuanian State. The basic weapon of this cavalry was the light spear called "rohatyna". Still in the 17th century the Tartar community of Lithuania reached 50 thousand people. The national Tartar spear or light lance - rohatyna - gained such esteem that even a medium-armoured cavalry called "Petyhorcy" adopted this weapon. At the end of the 14th century Lithuania and Poland were joined into a United Kingdom under the rule of the Jagiellons and several cultural features were exchanged between the two nations. Nevertheless, for a long time the rohatyna-lance remained a Lithuanian speciality. Only a few Tartar troops also took Polish service at the beginning of the 16th century, a greater number of them appearing in Poland in the middle of the next century. The length of the Tatar lance in the period from 16th to the 18th century ranged from 230 to 280 cm. The battle value of this weapon was fully appreciated as late as the early 18th century, in the time of the tactical successes of the Lithuanian-Tartar cavalry. From the end of the 17th century till 1763 Poland remained under the reign of the Saxon electors, Augustus the Strong (1697-1733) and Augustus III (1733-1763). Both Kings were enchanted by various phenomena of Sarmatian culture and especially by the light cavalry, completely unknown in the Western Europe of that period. Eagerly they recruited the troops of this cavalry to the Saxon army. It is reported that in the first phase of the Northern War (1700-1711) in Augustus the Strong's camp at Riga there were about 1200 horses of the light Tartar cavalry furnished with lances. In 1735 Augustus III formed for the first time in history a regular regiment of lancers, greatly distinguished in both Silesian Wars. Deeply impressed by the evident superiority of the lance, Frederick II of Prussia introduced some similar units to his army. A great success was gained by the Tartar cavalry at the time of the Seven Years War, to mention here only the battle at Kolin (1757) or the temporary occupation of Berlin (October 1760), the latter being a sensation for the observers of this war. This was also an experimental period for the practical manipulation of the lance and of the tactical use of the lancers. After the death of Augustus III all units of the Lithuanian-Tartar cavalry returned to Poland and the famous lances were adopted by other Polish troops, as was mentioned at the beginning of this article. At that time the lance was about 260 cm long. The situation of the declining State was not very favourable for the new lancers. They played but little role in the unfortunate war of 1792 and in the Kościuszko Rising of 1794. A new epoch for the lance was opened after the collapse of the Polish-Lithuanian State when a new army was formed abroad at the dawn of the Napoleonic period. 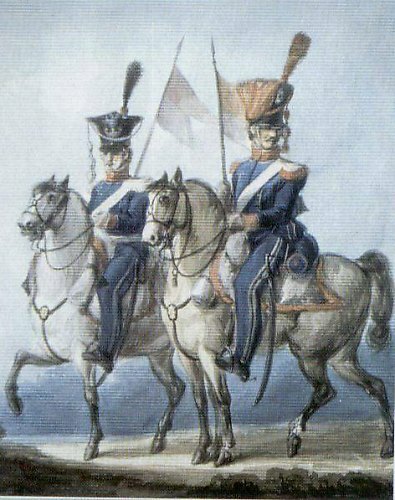 The cavalry regiment of the Polish Auxiliary Legion of the Cisalpine Republic in Italy was created at the turn of 1798 and 1799. This regiment, armed with lances, fought all the time, till 1815, outside Poland but greatly contributed to the fame of the Polish lance all over the world. In the ranks of this regiment the system of handling the lance was minutely practised and then put into formal military regulations (1810). Translated into foreign languages, it was taken over by most of the European armies and maintained throughout many decades, even in the times when the authors had quit the world scene. 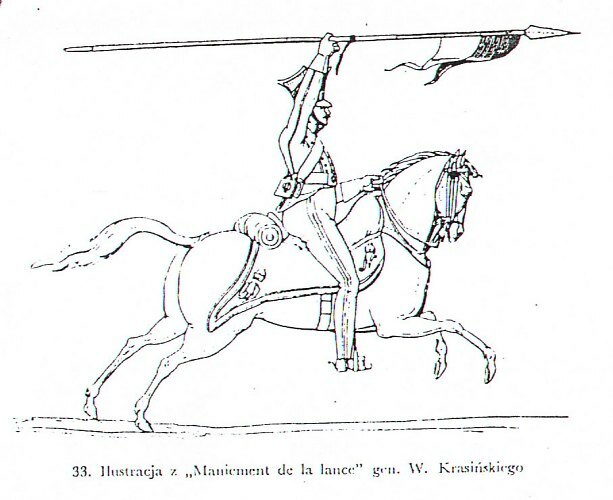 In lance handling the Legion cavalry, later the Ułani Nadwiślańscy (Vistula Lancers) and the 7th Regiment of Chevaux-Légers Lanciers of the French Line proved unmatched masters, showing an unquestionable superiority. The history of this regiment is the same time the story of the lance, demonstrated on numerous battlefields. As a unit of the French Army in Italy (Armée d'Italie), the regiment fought in the northern part of the country, at Trebbia (June 1799), being the only troop which could successfully oppose the cossacks of Suworow. In December 1799, pushed over to the Army of the Rhine, it won laurels at Hohenlinden (1800). In 1807 it was again in Italy (Naples and Rome) and then, over a long, route (via Dresden, Wrocław, Berlin and Paris) arrived in Spain (May 1808). Here began the most brilliant chapter in the regiment's history. 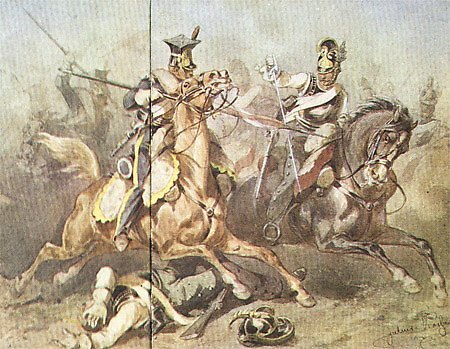 The Polish lancers distinguished themselves at Tudela and at Aragon (June 1808). In December of the same year, they turned the scale of victory at Aimarez, later on they happily broke through the enemy's ring at Ivenes (April 1809). They decided the victory at Ciudad-Real (March 1809) and inflicted a crushing defeat on the British cavalry, especially on the 13th Regiment of Dragoons, in the charge at Talavera de la Reina (July 1809). At Ocana (November 1809) a 5 thousand strong corps of Spanish cavalry was routed. 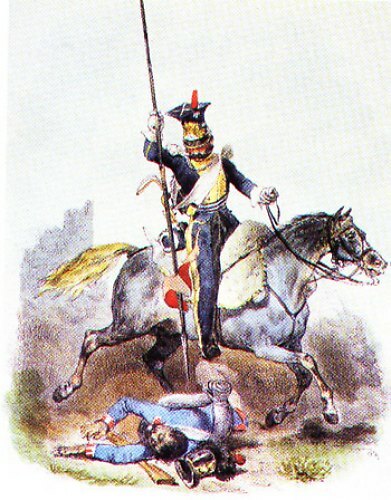 At Arquillos (January 1810) 2 thousand Spanish infantrymen were taken prisoner by the Polish lancers. At Albuhera (May 1811) in a very short time a similar fate befell the three regiments of British infantry: 5 standards and 900 prisoners were taken by the Poles. In the period of the Russian campaign, when all the Napoleonic forces were engaged, Marshal Soult, breaking orders, decided to keep with himself the squadrons of the regiment till the summer of 1812 and even longer, till the spring of 1813. 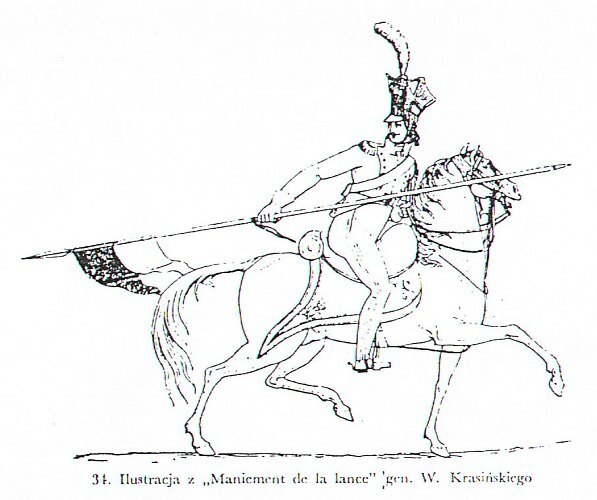 The fame of the Polish lance had reached its climax, and another Polish cavalry regiment, the Chevaux-Légers of the Imperial Guard, largely contributed to this fame, particularly after the battle at Wagram (July 1809). These young cavalrymen brought defeat to the Austrian uhlans, having snatched the lances from their hands and turning against them. "Qu'on leur donne lances, puisqu'ils savent si bien s'en servir" called out Napoleon when this deed was reported to him. Soon the chevaux-legers were really furnished with lances. The chevaux-leger lance was 276,9 cm long while that of the 7th lancers regiment was about 12 cm shorter. It is significant that mastery of handling was achieved with the shorter weapon. 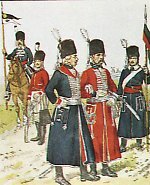 Thus, in the army of the Polish Kingdom (1815-1830) the average length of uhlan lances ranged from 258,8 to 230 cm. On the contrary, the French lance, which according to the regulations of 1811 was 276,1 cm long, in 1914 was already 297 cm long because of the false supposition of it effect increasing with length. In fact, the longer it was the less effective was this weapon. The Polish uhlan with his lance disappeared from the European scene in 1831 after the fall of the November Rising, being absent exactly 87 years. When independence was finally regained, in 1918, the Polish cavalry was given a lance with a steel shaft, 297 cm long, of French style. Technically imperfect as it was, it soon achieved esteem in Polish hands. In the interwar period the lance played above all a didactic role, preparing new generations of Poles for their military duties, building character, physical efficiency, courage, and quick decision. In the campaign of September 1939 the lances were not used. Reports on lance charges against the German tanks were obviously the invention of enemy propaganda. Some words should be added about the lance adopted by the foreign armies. The oldest, outside Poland, regular regiment of lancers, dated 1735, was formed from the Tartar-Lithuanian troops in Saxon service, mentioned above. Having dismissed them to Poland Saxony remained without lancers till 1813. The second oldest, dated 1741, was the "Natzmer Ulanen Regiment" founded in the Prussian army by King Frederick II. 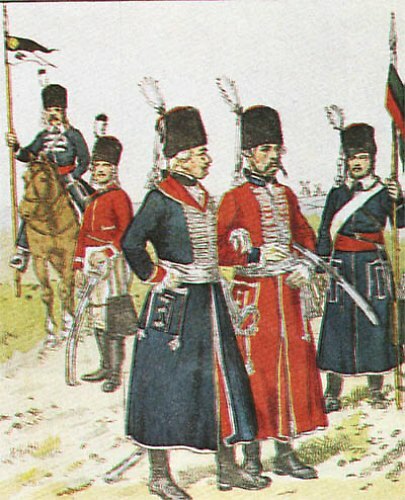 In the following periods similar regiments were formed: "Bosniaken Corps" (1745-1800), "Towarzysz Regiment" (1800-1807), and "Ulanen Corps". In all these formations Polish elements predominated, a lance of about 319 cm being the basic weapon. This persisted in the Prussian army till 1918, finally being made entirely of steel. The third formation to be mentioned here are the so-called "Volontaires de Saxe" created in France in 1743 by Maurice de Saxe, a morganatic son of King Augustus II. Poles were recruited and the Polish military organization of "gentleman troopers" and "privates" was maintained, their lances being 270 cm long. This weapon was removed from the ranks in 1762 when they were changed into a dragoon regiment. Thus, the French army was deprived of lances till 1811. Next in turn, Austria as early as 1784 formed some volunteer divisions of lancers called "Ulanen", which from 1791 became regular troops. The lance persisted in Austria till 1884, having all the time a wooden shaft and being 262 cm long. Russia formed her first regular troops of lancers as late as 1803 but earlier there were cossacks, light horsemen, in the Russian service who carried lances according to the Polish regulations of 1789; they persisted till 1917. The same is true of the regular line Russian lancers. France introduced the lance to army after 1811, changing six dragoon regiments into lancers. The Great Army of 1812 had altogether (including the Polish corps) 29 cavalry units armed with lances. The French kept lances till 1918. In the British army the lance appeared as late as 1816 but was still used there in lancer regiments in 1927, always keeping its classical length of 9 feet 1 inch, exactly as much as the Polish pattern lance carried off from the battlefield of Waterloo. It is worth noting that in 1820 the Polish regulations of lance handling were published in London in an English version, the book being adorned with the equestrian portrait of Prince Józef Poniatowski. The English lancers were uniformed in true Polish fashion. The British soon became devoted lancers, as the love of the horse goes together with the love of the lance. One could write much more on the lance, one could trace its route to the farthest corners of the world: to Mexico with the horse guards of the unfortunate Maximilian, to India and its Bengal lancers. We could find lances even with the horse guard of the Mikado of Japan. The history of the lancers in Egypt, Persia, and in the countries of South America has not yet been written. But today, when the lance has been reposited for ever in museums, one thing is absolutely certain: this weapon has also for ever been bound with the name of Poland, with the name of the Polish lancer.